Building on its storied heritage and commitment to innovation and design, The Rockport Company has introduced, a new evolutionary footwear collection featuring adidas TORSION® System technology. The new collection, with men’s dress, casual and outdoor looks, brings a new level of comfort to the lifestyle shoe market. It combines advanced-technology engineered for athletic footwear with modern, sophisticated style. First launched by adidas in 1989 and worn by top professional athletes around the world, TORSION is a lightweight arch support allowing the shoe to closely mimic the natural twisting movement of the foot during each step. With the new technology in place, the forefoot and rearfoot of the Rockport collection will move independently for better stability and support. TORSION will work in conjunction with Rockport’s unique Dynamic Suspension™ technology, which offers air-based cushioning, to deliver superior comfort and enhance the in-shoe experience. At its launch, the Rockport with adidas TORSION System collection will include 25-30 styles. Prices are expected to range from £60 - £100. The new line will be available at specialty retailers and premium independent stores in September. The shoe has been engineered and created specifically for the athlete who takes cross country running seriously. What’s more it won’t comprise with cushioning and comfort. adidas has launched a new running shoe with ‘bounce’ technology which channels all your energy into propelling you forward, into your stride. The sleek new BounceTM shoe is perfect for gaining the edge on your competitors whether on the running field or on the high street. BounceTM ‘structures’ under the heel of the shoe provide a rebound effect on impact and springboard you forward. To highlight the shoe’s advanced technology, these ‘structures’ are visible for the first time through a transparent heel panel and are developed to create a lighter weight shoe and help cushion your step. From the striking blue colour pallet to the unique BounceTM structures in the heel, this shoe is perfect for the person who wants a head start on the field and the street. Footwear sizes range from 6-12 and are priced at £65. Irish professional golfer and HI-TEC sponsored player Padraig Harrington certainly proved that power does come from your feet by becoming the first European to win the British Open in 8 years. 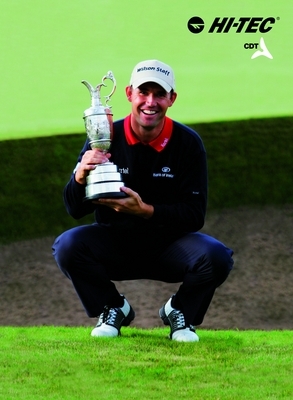 Harrington, powered by his HI-TEC CDT Super Power shoes, beat Sergio Garcia by one stroke in a four-hole play-off. The 35 year old Dubliner, who won the Irish Championship via a play-off last week, clinched the 136th Open Championship at Carnoustie after one of the most dramatic finishes in the history of the Open. Harrington has been working alongside leading footwear brand HI-TEC for 11 years and was instrumental in the design and development of the groundbreaking CDT Power concept, proven to be the world’s first game improvement golf shoe technology. Jodie Kidds’ fashion insight and golfing experience combined with HI-TEC’s golf footwear expertise and innovative V-Lite technology has resulted in the outstanding SS07 collection. Her role as design consultant on the all-new exclusive JK line, complete with personalized logos, is sure to grab the world’s attention and signals the start of Jodie Kidd’s successful collaboration with HI-TEC throughout their ladies lifestyle collections. The V-Lite Chameleon JK (SRP £60:00) is a unique concept in ladies golf footwear as it offers the wearer ‘4 shoes in 1’ thanks to the “easy release” press-stud saddle. The V-Lite Venice JK (£50:00) is elegantly designed and features the exclusive V-Lite sole unit resulting in comfort, style and power. Jodie Kidd comments, “This new collection focuses on colours, different leathers and textures. There is a real gap in the market for high performance, high fashion fantastic golf shoes and I want to plug this gap”. Women’s golf is one of the fastest growing arms of the leisure industry and is enjoying an unprecedented spell of celebrity endorsement. Jodie Kidd first met leading sports footwear brand HI-TEC during the celebrity endorsed ALL*STAR Cup held last year at the Celtic Manor Resort, Wales. Her major complaint was she always has a huge problem finding decent women’s golf shoes that meet her required level of performance, comfort and functionality, not forgetting up-to-the-minute catwalk style. HI-TEC, the UK’s number two golf footwear brand, recognized this as the perfect opportunity to partner up with this well known celebrity trendsetter and invited her to collaborate on the initial design and development ideas for their ladies golf footwear collection. Jodie’s fashion insight and golfing experience combined with HI-TEC’s golf footwear expertise has resulted in the outstanding collection. Her role as design consultant on the all-new exclusive JK line, complete with personalized logos, is sure to grab the world’s attention and signals the start of Jodie Kidd’s successful collaboration with HI-TEC throughout their ladies lifestyle collections.